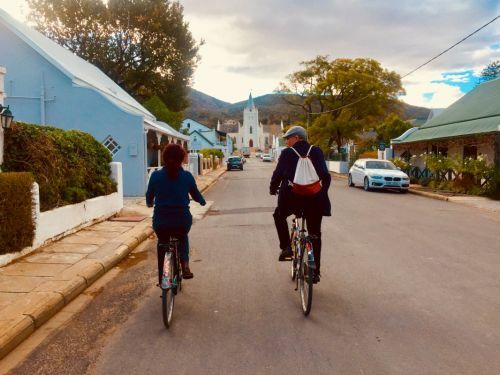 Explore Montagu on an art bicycle! Choose a guided town tour or rent a bike. Or if you don't feel like being active, visit our gift shop for the perfect handmade gift from South Africa. Flying Feet offers guided town tours which include historical and art tours. Flying Feet can customize tours for cyclists and walkers. You can also rent a bike and explore Montagu on your own. Montagu is a town filled with beauty and history. The beauty is obvious. The history not so much. Join Marchelle van Zyl on a personalized guided tour. She is a qualified guide and will unlock the fascinating past of the town and the people who lived here more than 25 000 years ago. 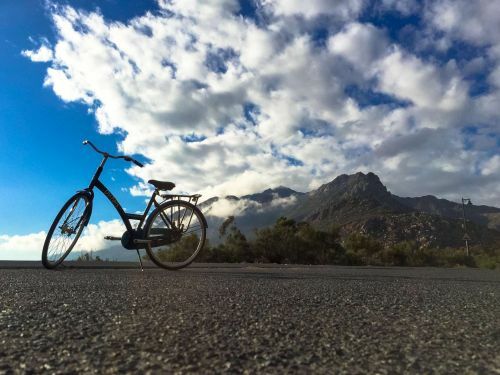 If you are in the mood to explore Montagu on your own, rent one of our bicycles. We'll provide you with a little backpack for your personal belongings, shopping or picnic supplies. Surrender yourself to the magical Klein Karoo tranquility and beauty. Hop on one of our bikes and escape into Karoo hospitality, architecture, culture, art, history and muscadel. Cycle around town, stop and chat to a local or go for a picnic and marvel at the Langeberge's geological features. 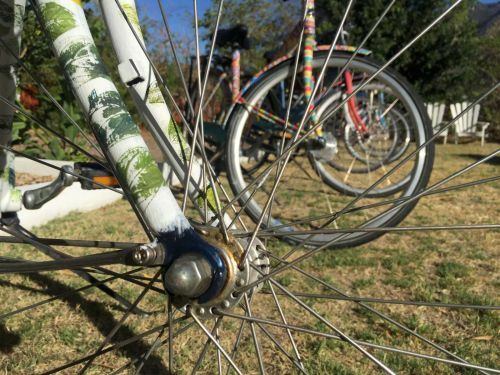 Our bicycles are Dutch-style, single speed, backpedal, hand painted, well loved town bikes. Nothing fancy. Just wheels and pedals. Each of our well loved bikes was hand painted by a different local artist and therefore is unique. We have exceptional artists in Montagu and they were very keen to be part of Flying Feet's Art Bicycle Project. Each bicycle has an information leaflet which tells you more about the artist who has painted it. So take a walk amongst our art bicycle 'gallery' and take your pick. These Dutch style bicycles are perfect for town exploration. You can view the world from above in a comfortable sitting position. No bums in the air or having to figure out different gears. Nothing fancy. Just an exceptionally beautiful ride. Flying Feet is located next to the Information office in 24 Bath Street. If you seek quality handmade gifts or souvenirs, come and visit our shop. We support local artist and community projects like the Toy Project and Celebrate Life which create jobs by sharing skills and creating opportunities. Be part of The Chain Reaction and shop with a conscious. 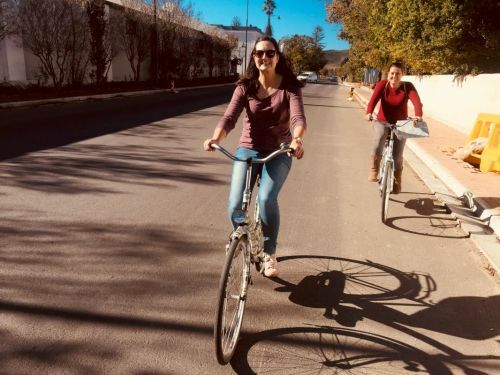 Share our triple love: Montagu, Art & Cycling. Cycling is freedom. It brings you closer to the community, to the people, the smells and sounds of Montagu. Feel the Karoo wind in your hair. Smell the braai fires. No car window. No filters. Just Montagu. R40 an hour. Deposit and ID required. Visitors can choose a vibrant town tour, an art tour or a combination of the two. You'll be immersed in the lifestyle, history and heritage of this beautiful village. Your friendly registered guide will tell you stories of the history of the area, the town and the stories of the people who shaped this town. 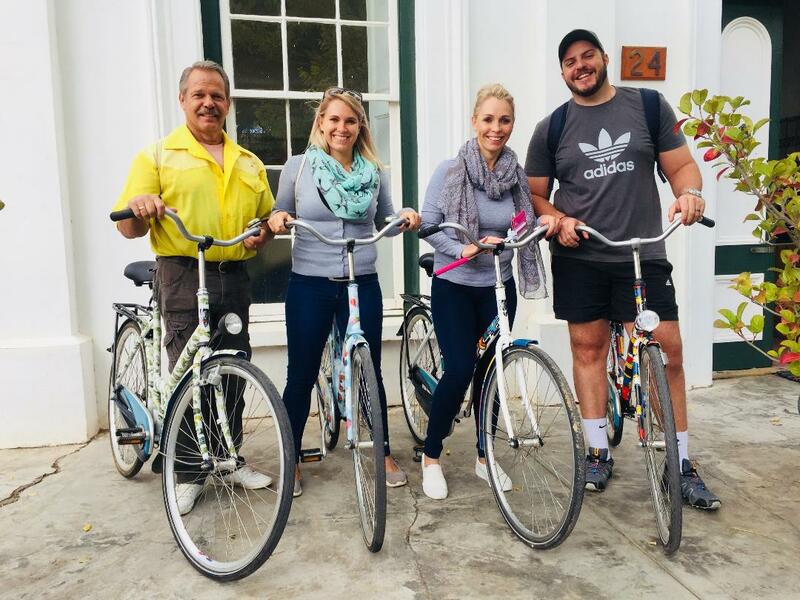 The art tour includes visits to local art galleries, the Francois Krige exhibition at the KWV museum and a private studio tour of one of Montagu's resident artists, Hanna Naude. The routes are not technical, a low fitness level is adequate as the focus is on fun. Private, customized tours are available on request. Walking tours are also available for those who are not comfortable on a bicycle.